Bishop, CA – Leigh Shambo’s psychotherapy practice and educational workshops incorporate horses to guide clients in search of self-awareness and better relationship skills. An accomplished equestrian coach with a master in social work, Leigh attracts clients interested in personal growth, psychological, spiritual and energy work. “The most meaningful work for horses today is to guide us in a new language of connection – to nature, ourselves and each other,” says Leigh. She is a skilled facilitator who teaches people about self-awareness and relationships through guided interactions with horses. The horse activities focus on a “horse whispering” model that is easily practiced by people with little equestrian experience, and is also rich with subtle dynamics that bring added insight for those with years of horse experience. Leigh hosts workshops and is regularly invited to teach at equine facilities throughout the United States, Canada and Europe. Participants are often strongly attracted to horses, with varying levels of actual riding experience. Leigh says she, “facilitates client learning by allowing the horses to be engaging, fun-filled mirrors to people’s strengths and their inevitable human foibles. We create the safe human community in which this work is witnessed and contained.” Her workshops range in length from one to five days and provide a basis and inspiration for personal growth and change. Leigh has a unique gift for leading people into authentic, respectful and effective relationships – with horses and each other. 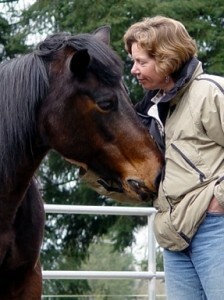 Founder and President – Human-Equine Alliances for Learning. Editors and Publishers: This news release is available to be published in your print or online publication upon receipt of permission from Leigh Shambo MSW, LPCC. You must include all contact information listed at the bottom of the article and a ‘hot’ link to this website – www.humanequinealliance.com.